Today, July 23, Sen. Jeff Merkley (D-OR) and Rep. David Cicilline (D-RI) introduced the Equality Act in the United States Congress, a bill seeking to protect LGBT people from discrimination across a number of areas, including employment, housing, public accommodations, education, credit and federal funding. Nearly 70 percent of Americans – including 65% of Republicans – support protecting LGBT people under non-discrimination laws, a June 2015 Public Religion Research Institute poll found. While the introduction of the Equality Act is an important in advancing protections for LGBT people, 33 states still lack explicit, comprehensive protections uniformly across employment, housing and public accommodations. This represents more than 50 percent of the American population. 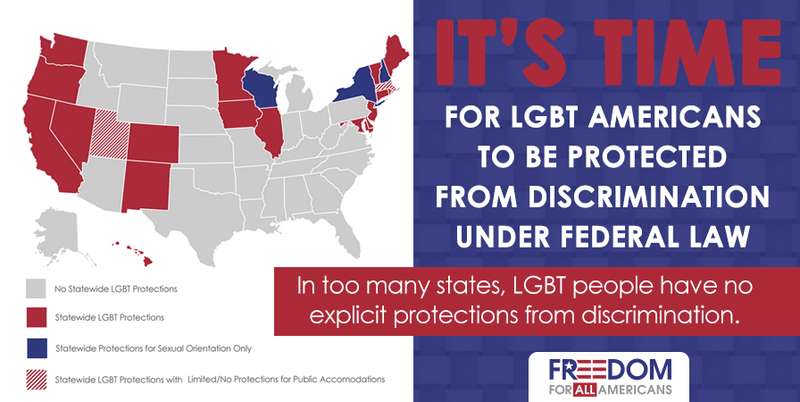 Freedom for All Americans is the bipartisan campaign dedicated to ensuring every gay and transgender American is fully protected from discrimination under the law, no matter where they live. Our work brings together Republicans and Democrats, businesses big and small, people of faith, and allies from all walks of life to make the case for comprehensive nondiscrimination protections that ensure everyone is treated fairly and equally.